It took longer than expected, but Red Sox top prospect Xander Bogaerts (pictured) has earned a SoxProspects weekly award this season, as the community voted the shortstop for this week's SoxProspects Player of the Week. Accompanying Bogaerts is his Portland teammate Anthony Ranaudo, who garners SoxProspects Pitcher of the Week for the second time this season. 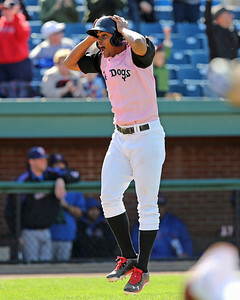 Bogaerts enjoyed the best seven-game span of the season, and quite possibly his career, last week, posting a .522/.625/1.043 slash line with three home runs, three doubles and seven walks while striking out just once over 32 plate appearances with the Sea Dogs. He's now batting .302/.393/.490 for the season, a line that's marred by the first two weeks of the season in which the 20-year-old batted .245/.286/.283. Bogaerts, who claims he thought he couldn't hit anymore during that two-week stretch, has drawn 28 walks in 225 plate appearances this year, which is a testament to his improved discipline as he drew just one walk in 97 plate appearances in Portland last season. Ranaudo, who earned SoxProspects Pitcher of the Month for May, made just one start during this week's award period, but that was all he need to lure votes from the community. The right-hander limited the New Hampshire Fisher Cats to one hit over seven scoreless innings on May 29, while striking out eight without walking a single batter. The 23-year-old has a 1.48 ERA and a 0.841 WHIP this season with 58 strikeouts over 54 2/3 innings of work.